Looking for something to do August 10, 2018? Look no further!! Claws & Paws Veterinary Hospital is holding their “2nd Chance Connection” at Pearland Barkway! The address is 1853 Pearland Parkway, Pearland, Texas 77581! It will be held from 7-9 pm and full of fun for you and the pups! 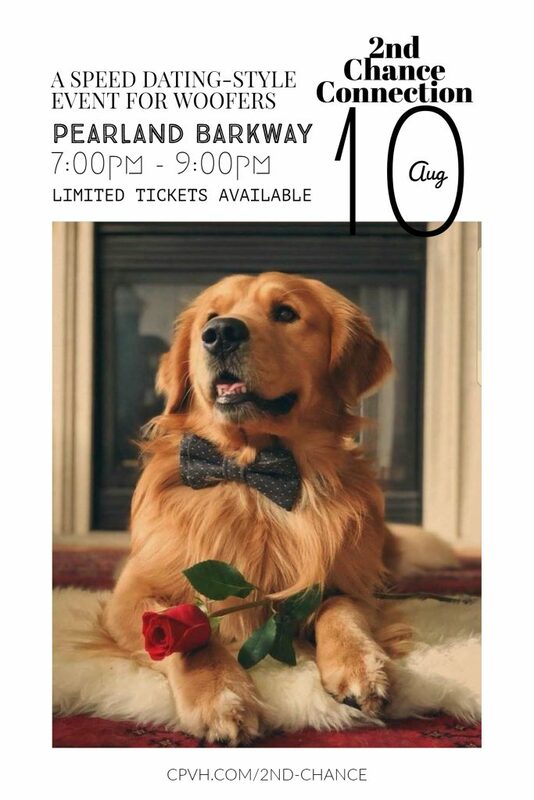 The Pearland Animal Shelter is partnering with Claws 7 Paws Vet Hospital to help get some of their sweet animals out of the shelter, as space is becoming less and less! This is an adoption event, however it will have a tiny twist to it! It will be speed-dating but for your family & a furry friend! Each round you will try to see what kind of connection you have with the animal and then the bell will ring and you will switch to the next station. You will be able to ask questions about the animals and play with your potential, furry family member! They will have applications on hand for you to fill out on location as well! If you are NOT ready to adopt, you can STILL join in on the fun as well and play with the animals or consider fostering one of the animals! There will be snacks for you and the furry friends so don’t worry!! Buy your tickets now for $10 per family and get even more info HERE. Help us give these amazing pets a second chance for a good home and love! !